Prime Minister Theresa May will seek to renegotiate the EU divorce deal, her spokesman said Tuesday, ahead of crunch votes in parliament that could reset the course for Brexit. With exactly two months to go until Britain is scheduled to leave the European Union on March 29, May is going to attempt to change the agreement she herself negotiated — even though Brussels has insisted it will not re-open it. “We have to have a deal which can carry the support of parliament and that’s going to require some changes to the withdrawal agreement,” May’s spokesman said, as Downing Street tried to seize the initiative back from MPs. The draft divorce deal was overwhelmingly rejected by lawmakers on January 15 and deeply divided MPs have been coming up with their own ideas to take a different path. 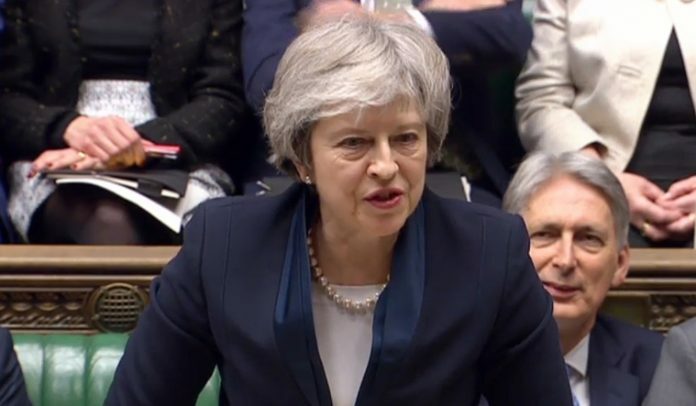 After May opens a day of debate, MPs are set to vote from 1900 GMT on measures that could include preventing a no-deal Brexit, delaying Brexit, changing the negotiated deal and even seizing control of the entire process. May’s spokesman said she backed a proposed measure that called for the removal of a controversial Irish border “backstop” arrangement written into the divorce deal. Brexit hardliners from May’s Conservative Party are set against the deal due to the backstop, which could see Britain indefinitely tied to EU trade rules in order to keep open the border with the Republic of Ireland. The proposed measure put forward for Tuesday’s votes calls for the backstop to be replaced with “alternative arrangements to avoid a hard border” on the island of Ireland. The amendment would make clear that the Commons wishes to leave the EU with a deal, confirms the commitment to avoiding border checks and “gives us scope for a new discussion with the EU about how best we achieve that”, said May’s spokesman. She told her cabinet that “to win the support of the House of Commons, legal changes to the backstop will be required”, he said. Confidence in London about being able to change the agreement is met with disbelief in Brussels. Sabine Weyand, deputy to EU Brexit negotiator Michel Barnier, said: “There’s no negotiation between the EU and the UK. That negotiation is finished. She said Britain risked crashing out of the EU without a deal “by accident” because London cannot decide what it wants. And Ireland’s Europe minister Helen McEntee called for “realism” from London as “there can be no change to the backstop”. Tuesday’s votes are the latest twist in the turmoil that the Brexit vote has unleashed in one of the world’s top economies. British stocks jumped Tuesday and the pound was firmer ahead of the votes. London’s benchmark FTSE 100 index was 1.3 percent higher in midday deals, while the pound held recently won ground versus the dollar. One of the amendments which could be voted on on Tuesday would open the door for the House of Commons to bring in legislation preventing Britain leaving the EU without a deal by forcing May to delay Brexit for nine months if her deal is not approved before February 26. It would also give MPs the ability to extend the deadline indefinitely. The main opposition Labour Party is throwing its weight behind the amendment.